Contagious mastitis can infiltrate closed herds. Cornell discovered that 340 herds had Staph aureus infections in just a two month period. Fluid Dairy Product Quality and Safety: Looking to the Future 14,000 people in Japan were sickened by milk contaminated with Staph aureus entertoxins (see page 6). site offers consumers insight into milk quality issues and the humane treatment of cows during the milking process. The University of Washington disclosed the fact that even with the best of milking procedures that Staph aureus is a major problem in their herd (see JDS 84:1976-1978). The US government has been investigating methods of genetically modifying dairy cows to make them more resistant to staph aureus infections. The introduction of milk into the consumer market will first require FDA approval and consumer acceptance of the taste. The approach is to genetically modify the cows to cause them to secrete a substance into the udder and milk that will kill the Staph aureus bacteria. Staph aureus is not very heat sensitive and therefore the endotoxins are not all destroyed by the HTST pasteurization process. 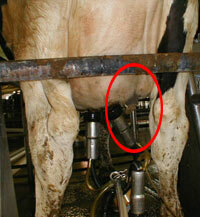 Deformed udder caused by mastitis.